Brian Jones, Janis Joplin, Jim Morrison and Jimi Hendrix all died at the age of 27 between 1969 and 1971. 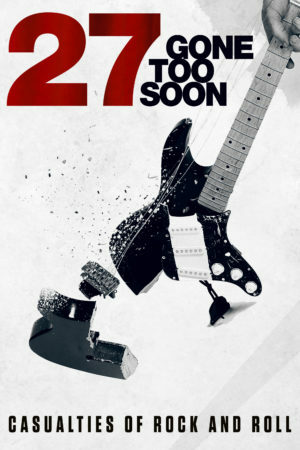 At the time, the coincidence gave rise to some comment, but it was not until the death of Kurt Cobain, about two and a half decades later, that the idea of a ‘27 Club’ began to catch on in public perception, reignited again with the death of Amy Winehouse in 2011. This group represent just a few of the many well-known singers and musicians who died at that age and this film looks at the phenomenon and tries to understand why these particular stars are so mythologised and celebrated – and why indeed their lives ended when they did. Through interviews with musicians, critics and medical experts, the film investigates the lives, music, and artistry of these lost icons, forever frozen in time at the age of 27.